The Doctor takes Leela to the planet Delafoss to show her an unspoiled and thriving human colony, only to find it instead choked by industrialization, its population turned to slaves controlled by the Eminence and its Infinite Warriors. 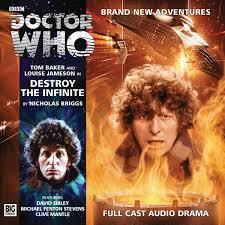 As the duo quickly joins a pair of resistance fighters trying to gather information about the ship, The Infinite, being constructed to turn the war against humanity in the Eminence’s favour , the Doctor quickly makes himself known as a threat and becomes a target for the all-powerful Breath of Forever. David Sibley does marvelous work as the chilling voice of the Eminence, contrasting nicely to the somewhat over-modulated Infinite Warrior voices and the stereotypical resistance fighter voices, and the Eminence again highlights how dangerous it can be as it packs The Infinite full of human hostages, the lives of which must be taken into account when the very ship itself is threatened with destruction. Surprisingly, given how prone to angry outbursts the Infinite Warriors are, the production plays the Fourth Doctor’s possession as incredibly subdued. Though it should come as no surprise that the Doctor is not truly under the Eminence’s influence even as he gains glimpses of entire galaxies destroyed by his foe, it seems like a bit of a missed opportunity to really let the ferocious potential of Tom Baker loose, especially given the utter terror Colin Baker imbued in his own release. With the Doctor seemingly against her, Leela steps into the spotlight admirably, inspiring Earth’s forces to take action and proving herself an adept tactician as her unwavering confidence in the Doctor shines. Louise Jameson has always done well when asked to bring Leela’s more savage side to the forefront, but she proves equally adept here when tasked with subtly highlighting Leela’s burgeoning conscience as the Doctor reminds her of all the lives lost to attain victory over the Eminence. Unfortunately, the supporting characters are rather under-developed, and telling the story through their eyes ends up being a bit less stimulating than it may have been otherwise, especially as this vast alien war is essentially full of World War II clichés and stereotypes. In essence, a reliance on clichés throughout the narrative is the biggest fault with ‘Destroy the Infinite.’ It maintains an excellent pace that rarely relents as gripping action unfolds, but everything that occurs is incredibly straightforward and predictable, meaning that the action alone has to sustain the story rather than the actual narrative itself. As a result, this introduction of an established villain to the Doctor has glimmers of potential but can’t quite reach the scope of its ambition.